The weather didn’t look too bad this morning consequentially a walk was planned for the local area. This time it was to the west of the canal and on examining the map I was surprised to see how close we are to Coventry. The walk ended up being about 18km, but more on that later. On my return to Waiouru I was in need of a hot shower. Jan had already run the engine to top up the batteries which meant there was plenty of hot water. It was a great shower… bliss! However on exiting the shower I realised I’d left my change of clothes in the adjacent master bedroom. Realising that there were no bungs in the bedroom portholes I made a dash for the bungs and bent over to slam one into the towpath side porthole. No passing walkers were going to catch me without my trousers! Reader you can imagine my surprise when I turned around to see a female face looking though the canal side porthole. I now hate boats with quiet engines. As for the look on the lady’s face, well it was; of course; admiration! She got blue mooned and the full monty. It either made her day, or she won’t be looking through portholes for some time. Back to the walk. Bridge 34 is looking rather sorry for itself. 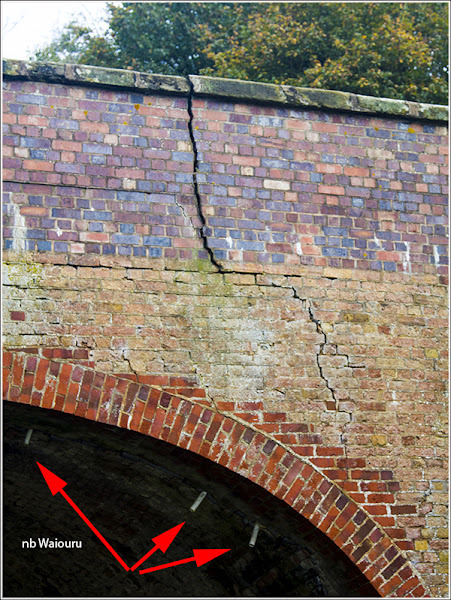 There is a large crack from the parapet to the arch. Water has obvious got behind the parapet and the side is starting to bulge. Some repair work has been attempted with short sections of plastic pipe being inserted into the base of the arch in an effort to drain the water. This is unlikely to be anything more than a temporary measure. 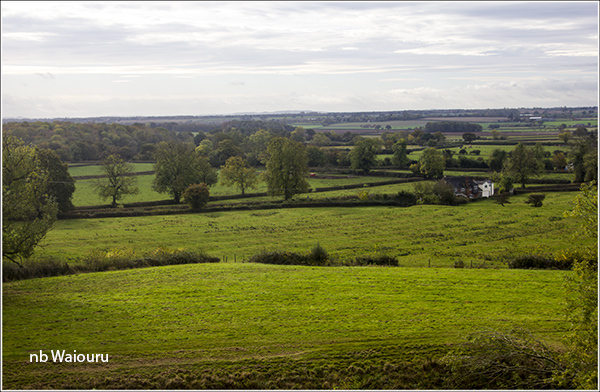 The planned route had me skirting around the northern edge of Brinklow village. On reaching the outskirts of the village it was possible to look back over the fields and see Waiouru in the distance. There she is….. right in the middle of the photo. What….. you can’t see her! Notice how the surface of the fields look like grandmas pantyhose. Off to the right was a hill that dominated the local terrain. It was almost a perfect inverted cone shape and looked artificial. Nature doesn’t usually produce a feature with straight edges. 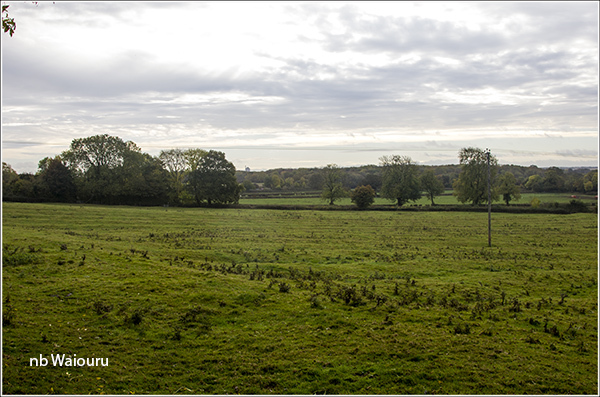 Deciding to divert from the planned route I walked to it and found Brinklow “Tump”. You can see the round knoll in the above photo. 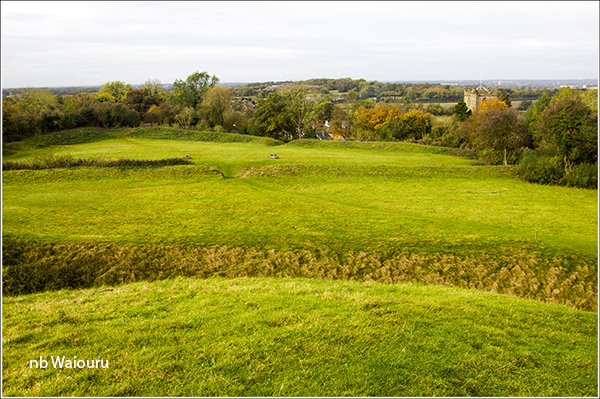 This is actually the motte of a Norman castle. A motte is an artificial mound of earth upon which a wooden or stone keep would be constructed. 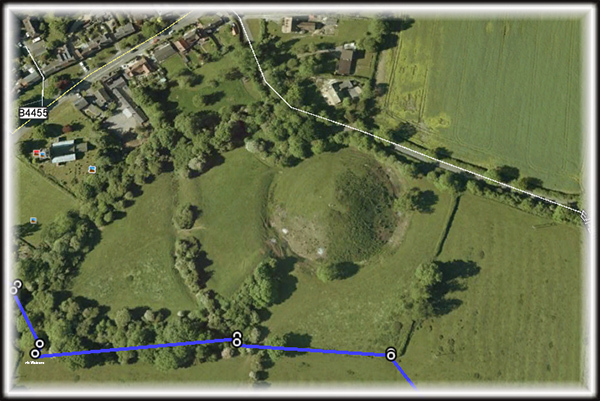 This particular site consisted of a motte and bailey. The castle had at least two rings of protective ditches. 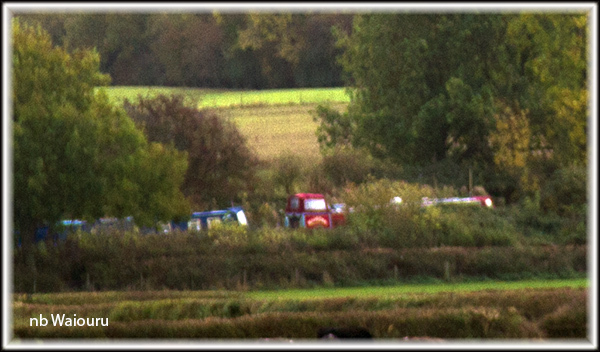 These can be better seen from the top of the motte. And just as good a views to the west. I suspect the distant high ground is near Ludlow where there is a location named “Richards Castle”. It would make sense of the few Norman lords to ensure they had selected commanding features on which to build their castles. 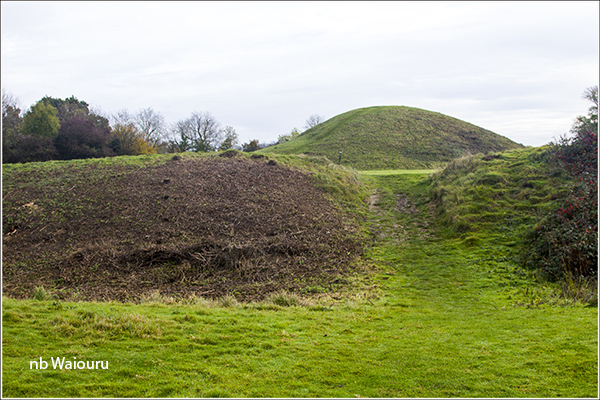 The locals have named the motte “The Tump”. Brinkow’s St John The Baptist church with a large factory in the distance which is my next walking waypoint. 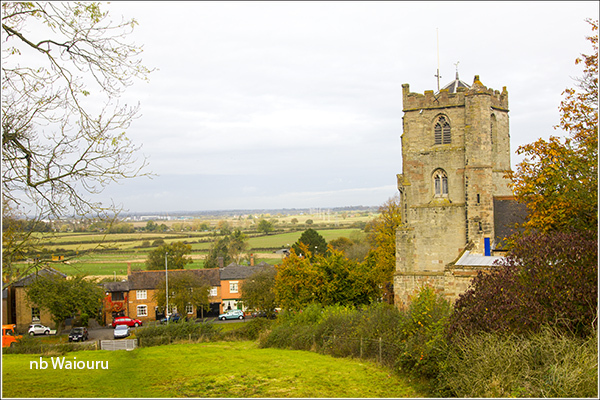 The origins of the church date back to the 14th century and it may have survived because Brinklow is located very close to the Fosse Way thus providing it with regular communications whilst other nearby villages fell into decline and have now disappeared from the map. Of course you are right!